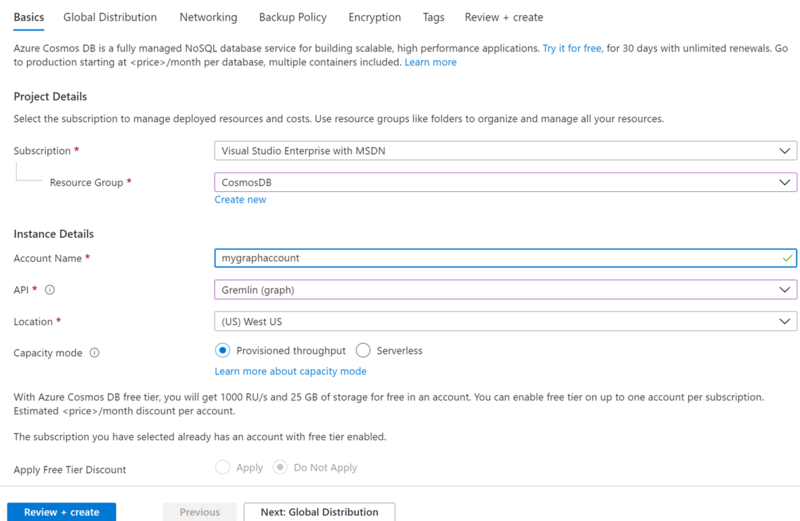 Azure Cosmos DB is Microsoft’s globally distributed multi-model database service. 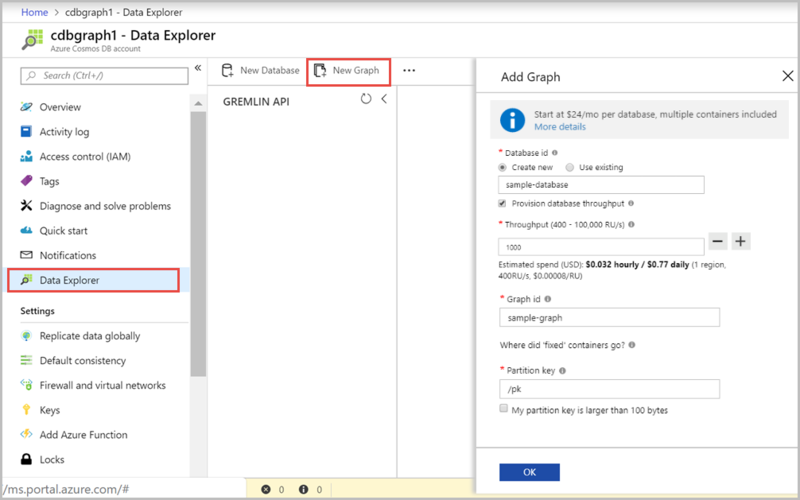 Using Azure Cosmos DB, you can quickly create and query managed document, table, and graph databases. 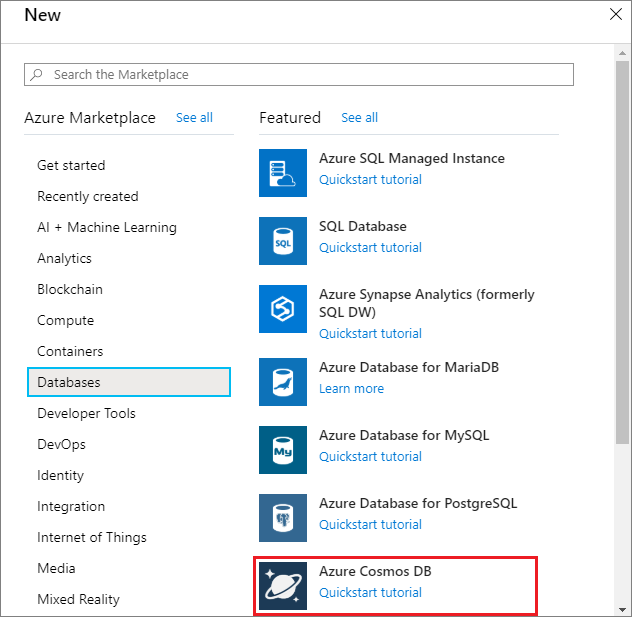 This quickstart creates a simple graph database using the Azure portal tools for Azure Cosmos DB. This quickstart also shows you how to quickly create a Java console app using a Gremlin API database using the OSS Apache TinkerPop driver. The instructions in this quickstart can be followed on any operating system that is capable of running Java. This quickstart familiarizes you with creating and modifying graphs in either the UI or programmatically, whichever is your preference. 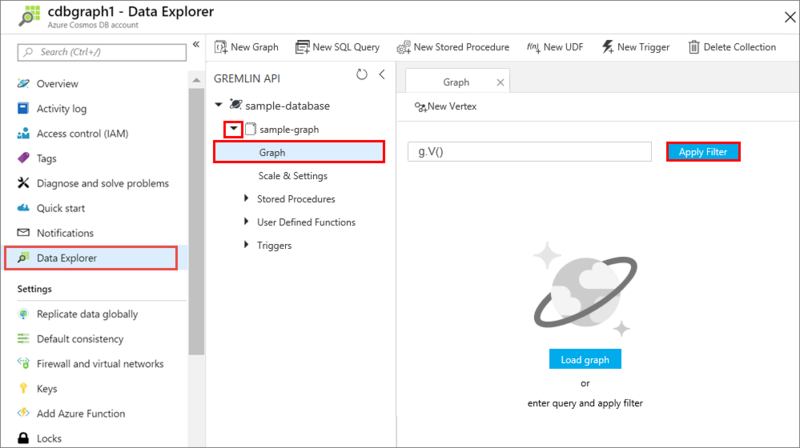 Before you can create a graph database, you need to create a Gremlin (Graph) database account with Azure Cosmos DB. Now let's switch to working with code. Let's clone a Gremlin API app from GitHub, set the connection string, and run it. You'll see how easy it is to work with data programmatically. Open a git terminal window, such as git bash, and use the cd command to change to a folder to install the sample app. The following snippets are all taken from the C:\git-samples\azure-cosmos-db-graph-java-getting-started\src\GetStarted\Program.java file. The Gremlin Client is initialized from the configuration in the C:\git-samples\azure-cosmos-db-graph-java-getting-started\src\remote.yaml file. Series of Gremlin steps are executed using the client.submit method. Now go back to the Azure portal to get your connection information and copy it into the app. These settings enable your app to communicate with your hosted database. In the Azure portal, click Keys. Copy the first portion of the URI value. Open the src/remote.yaml file and paste the unique ID value over $name$ in hosts: [$name$.graphs.azure.com]. 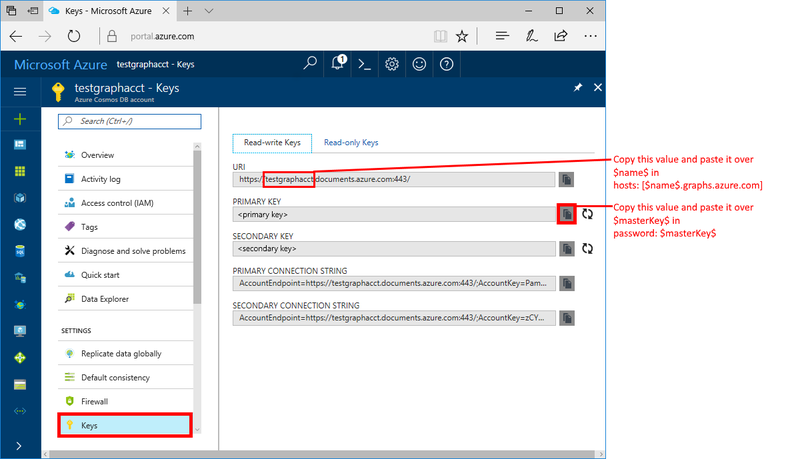 In the Azure portal, use the copy button to copy the PRIMARY KEY and paste it over $masterKey$ in password: $masterKey$. If you used a unique name for your sample database or graph, update the values as appropriate. In the git terminal window, cd to the azure-cosmos-db-graph-java-getting-started folder. In the git terminal window, use the following command to install the required Java packages. In the git terminal window, use the following command to start the Java application. The terminal window displays the vertices being added to the graph. If you experience timeout errors, check that you updated the connection information correctly in Update your connection information, and also try running the last command again. Once the program stops, press Enter, then switch back to the Azure portal in your internet browser. You can now go back to Data Explorer and see the vertices added to the graph, and add additional data points. Click Data Explorer, expand sample-graph, click Graph, and then click Apply Filter. In the Results list, notice the new users added to the graph. Select ben and notice that the user is connected to robin. You can move the vertices around by dragging and dropping, zoom in and out by scrolling the wheel of your mouse, and expand the size of the graph with the double-arrow. Let's add a few new users. Click the New Vertex button to add data to your graph. In the label box, enter person. Click Add property to add each of the following properties. Notice that you can create unique properties for each person in your graph. Only the id key is required. id ashley The unique identifier for the vertex. If you don't specify an id, one is generated for you. In this quickstart you create a non-partitioned collection. However, if you create a partitioned collection by specifying a partition key during the collection creation, then you need to include the partition key as a key in each new vertex. Click OK. You may need to expand your screen to see OK on the bottom of the screen. 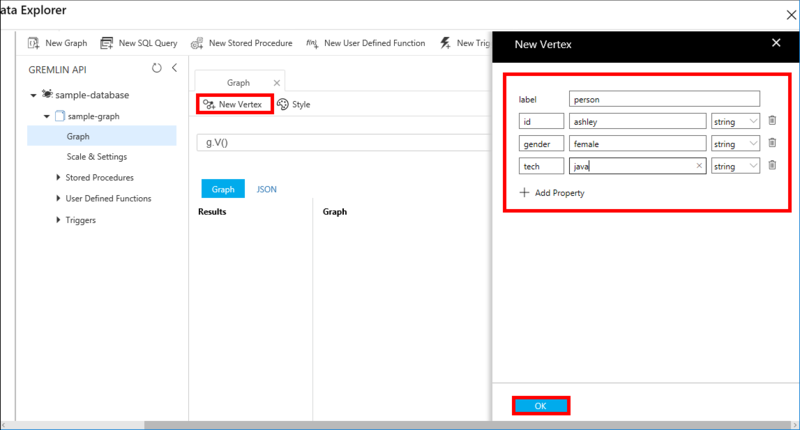 Click New Vertex again and add an additional new user. Enter a label of person. id rakesh The unique identifier for the vertex. If you don't specify an id, one is generated for you. Click the Apply Filter button with the default g.V() filter to display all the values in the graph. All of the users now show in the Results list. As you add more data, you can use filters to limit your results. By default, Data Explorer uses g.V() to retrieve all vertices in a graph. You can change it to a different graph query, such as g.V().count(), to return a count of all the vertices in the graph in JSON format. If you changed the filter, change the filter back to g.V() and click Apply Filter to display all the results again. Now you can connect rakesh, and ashley. 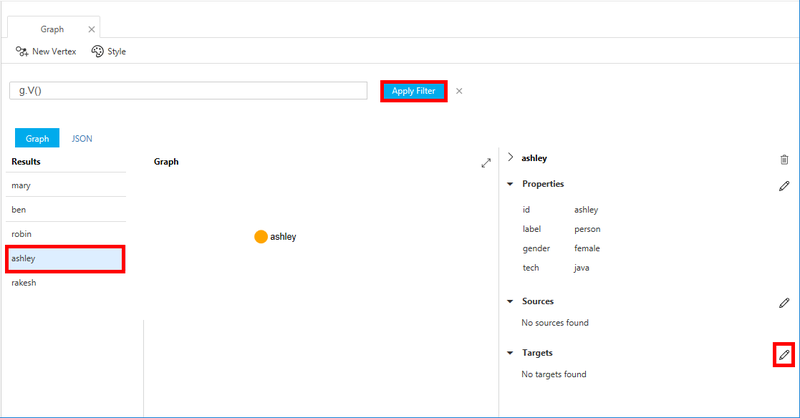 Ensure ashley is selected in the Results list, then click next to Targets on lower right side. You may need to widen your window to see the button. In the Target box type rakesh, and in the Edge label box type knows, and then click the checkbox. 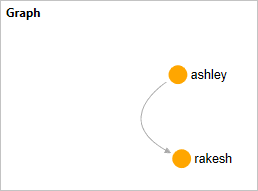 Now select rakesh from the results list and see that ashley and rakesh are connected. That completes the resource creation part of this tutorial. You can continue to add vertexes to your graph, modify the existing vertexes, or change the queries. Now let's review the metrics Azure Cosmos DB provides, and then clean up the resources.